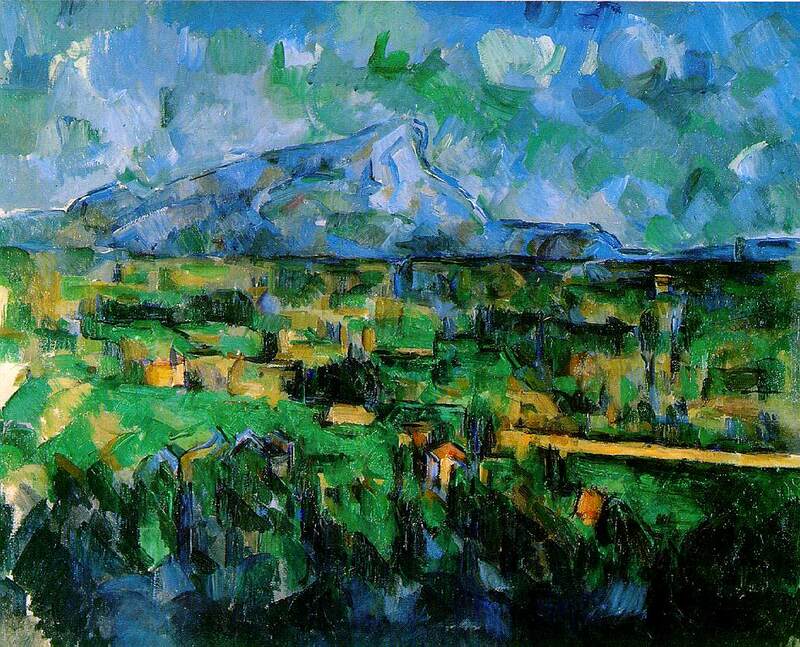 'Here is one of the last paintings CИzanne made of the mountain, and without the accompanying photograph of the motif it might be considered highly abstract. Definite transformations have certainly been made and the arbitrariness of the individual color planes is typical of the series of late paintings done from this location. 'The motif reveals typical aerial perspective or fading away of the mountain, which is seen here from a distance of eleven miles or more; but although CИzanne has eliminated its details he has given the mountain an intensity almost equal to that of the foreground forms and has emphasized its height. The photograph shows a gradual diminishing and fading away from the immediate foreground toward the distant mountain... CИzanne, on the contrary, has kept this vast space comparatively shallow without losing the effect of planes stepping back into the distance. In fact, CИzanne's painting actually involves more distance than the photograph shows. The large area of trees is almost entirely missing in the photograph.